Heat 1 tbsp of the olive oil in a pan and sauté the mushrooms for 3- 4 minutes. Remove with a slotted spoon and set aside. mushrooms and sauté the chopped shallots for 2-3 minutes. Add a splash of Pernod and boil rapidly for 1-2 minutes to reduce the liquid. Pour in the cream, bring to the boil and simmer for 1 minute before stirring in the grated Grana Padano. Simmer while you drain the pasta. 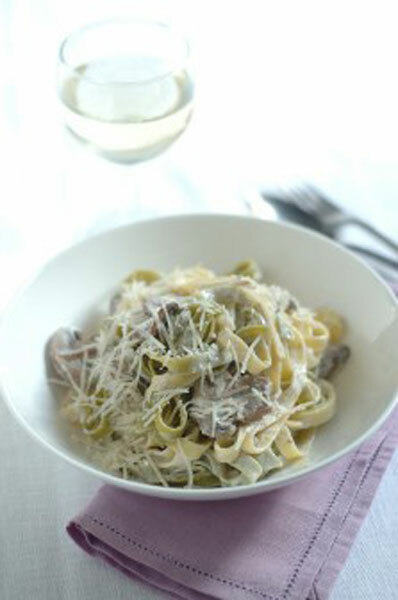 Return the drained pasta to the pan, pour in the Grana Padano cream and the mushrooms and mix well. Serve immediately with a crisp green salad.